He sent the footage to the British UFO Research Association (BUFORA) for analysis. 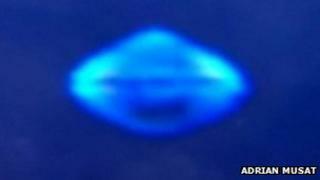 The experts said the object was not alien in origin, but actually a spotlight on a forestry vehicle. BUFORA said they were confident the light was actually within the trees and not above them. The light is believed to have been on the top of the cabin of a wood harvester. The Forestry Commission has confirmed it had tree-felling operations under way in the woodland at the time.